Options 1.6 oz Salmon 45pcs. 1.6 oz Chicken 45pcs. Packed with probiotics, vitamins C and E, proteins and other vital nutrients, Greenies Feline Pill Pockets are a yummy treat with a sneaky hole in the middle. When wrapping medicines in turkey, and stuffing them in cubes of cheese, your cold cuts always miraculously disappear. Yet somehow the medicine often turns up later, stuck to the bottom of a sock. 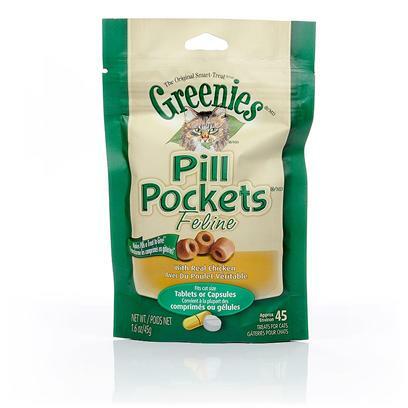 Greenies Feline Pill Pockets take the subterfuge out of pill administering, and could be just what the doctor ordered. Squeeze one pill pocket cylinder open. Pinch one end to seal. Insert the medication in question, then press the open end to seal. Offer the treat to your cat. Take pleasure in knowing you’re still the trickiest one in the relationship.